Combine the strength of powder-coated steel rails with the beauty of stainless steel to create an upscale planter with a contemporary style. 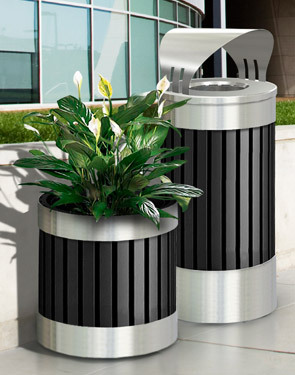 Pair this planter with the matching trash receptacles for an elegant, professional look with functionality in mind. Constructed with heavy-gauge, fire safe vertical steel rails and supported with 304-grade stainless steel, this planter offers extreme durability. The vertical steel rails are powder-coated black for ultra protection and the stainless steel trim rings won't easily rust maintaining a sleek appearance for years. Two 4-1/2" Decorative Stainless Steel Trim Rings. Black Polyethylene 19" H x 14" Dia. 3/4" Feet Protect Floors & Add Stability.